Beat together the butter and sugar in a bowl until smooth. Add the egg yolk and continue to beat until the egg is well combined. Finally add the flour and mix until you have a soft dough. Form the dough into a ball, then flatten and wrap in cling film. Put the dough in the fridge and allow to chill for 30 minutes. While the dough is chilling lightly grease all your tartlet tins with butter. Divide the dough into ten pieces then roll each piece out to a rough circle. Press the pastry gently into the tin making sure it is in all the corners. Trim the edges then chill in the fridge for a further 30 minutes. Repeat with the remaining pastry and tins. Preheat the oven to 180° Place all the tartlets on a baking tray and bake for 10 minutes, until pastry cases are golden. Remove from the oven and allow to cool. Melt the chocolate in a bowl over a saucepan of simmering water. Once the tartlets are cool brush the inside of the tart cases with the melted chocolate and leave to set. This chocolate layer helps keep the pastry crisp once you add the filling. While the chocolate is setting make the filling. Softly whip the double cream then fold in the vanilla yoghurt. 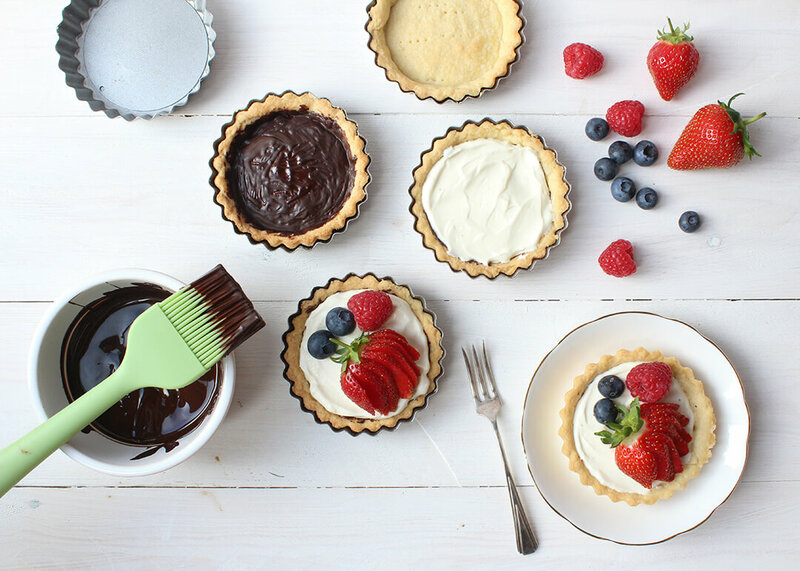 Share this filling between the tartlets then top with fresh berries. Keep tarts chilled until ready to eat.